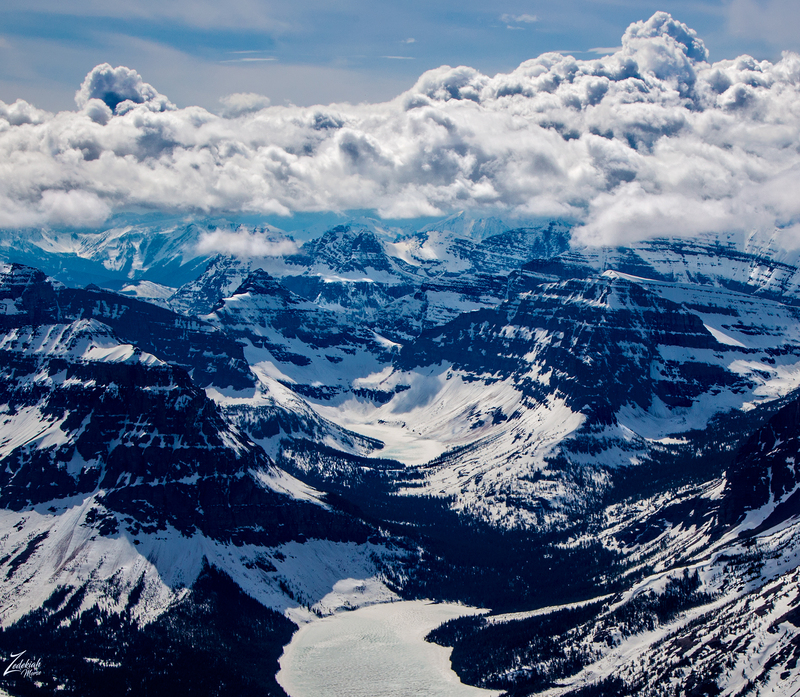 In the image above, the surface of a frigid Two Medicine Lake ripples in the afternoon wind while a storm front approaches, pushing over the towering barrier of the Rocky Mountains. On the left is Appistoki Peak while to the right, Rising Wolf Mountain is becoming cloaked in clouds and Red Mountain lays on the far right. 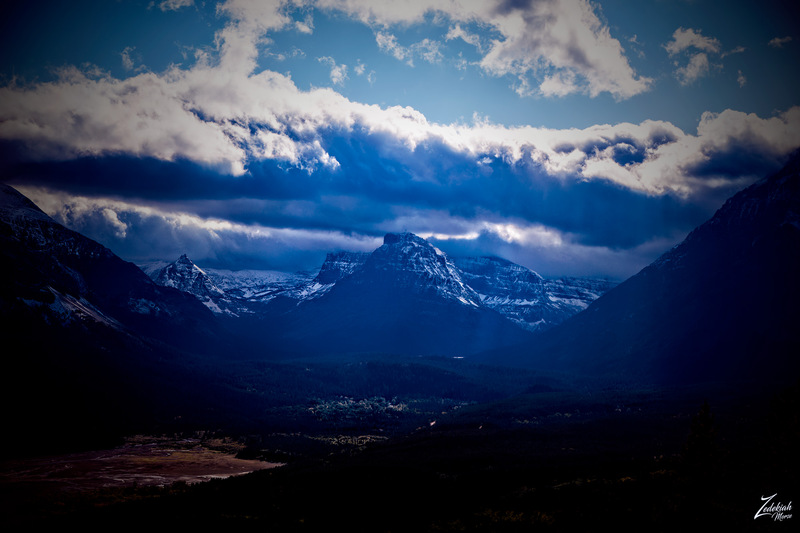 Two Medicine is one of the most revered places for the Blackfoot People, perhaps only Chief Mountain is more honored. These are truly sacred grounds. To the First Nations Blackfeet, all of these mountains, rivers, plants, and animals are sacred spirits who provide wisdom and guidance for living a good life. For time immemorial, these lands were considered a sacred place for Vision Quests, here is where they sought knowledge and strength from nature. Wilderness is an absolute necessary component of the Vision Quest ceremony. In the image above, Lower Two Medicine Lake is almost half dry in the late autumn months before the snows come. In the spring this lake will be overflowing with the massive amount of water from the snowmelt in the mountains above. On the horizon to the left in the distance is Feather Woman Mountain and to the right of that is Plume Peak then Mount Baldy and Medicine Ridge. The mountain peak in the center-left is Squaw Mountain, with Bearhead Mountain, Mount Ellsworth and Appistoki Peak to the right. In the mountainous valley to the right is Grizzly Mountain, Painted Tepee Peak is the pyramid-shaped mountain in the valley and all the way to the right is Sinopah Mountain. In the following image, Sinopah Mountain sits in the middle of the valley flanked by Rising Wolf Mountain on the right and Never Laughs Mountain on the left. Behind Sinopah Mountain are the sheer cliffs of Rising Bull Range and to the left of Sinopah Mountain you can see Painted Tepee Peak. 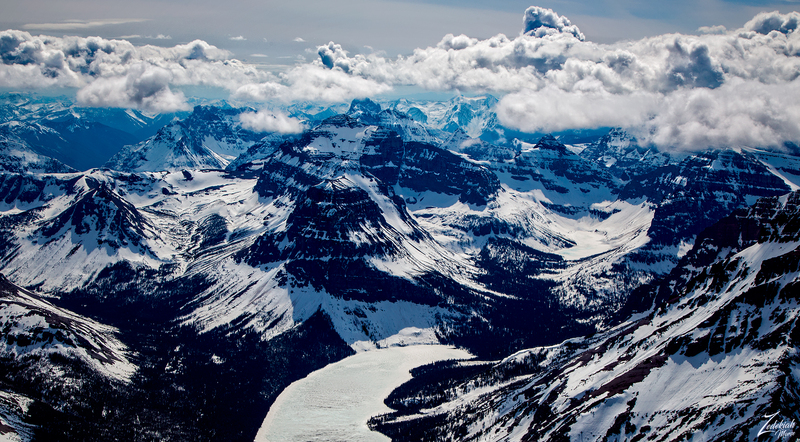 Blackfeet origin stories of humans and spirits have a traditional historic base in the Two Medicine wilderness. It is here that the sacred Sun Dance occurs, traditionally providing a living bridge between history and tribal culture for the new generations of Blackfoot people. 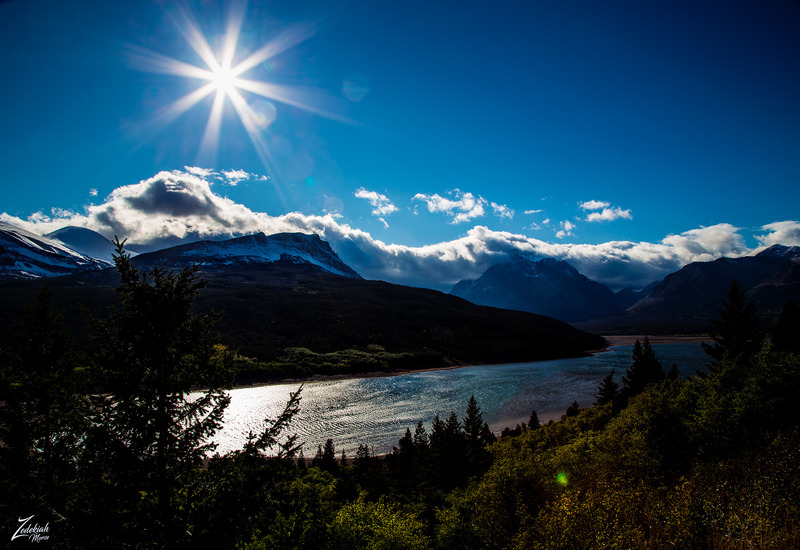 It is here in Two Medicine where the creator of the Blackfeet People brought forth the sun and created the world. He is known as “Na’pi” meaning “dawn-light color-man”. In his daily representation as the color of dawn, Na’pi is associated with bringing forth the Sun, and it is he who made these mountains and plains the traditional homelands of the Blackfeet Nation. 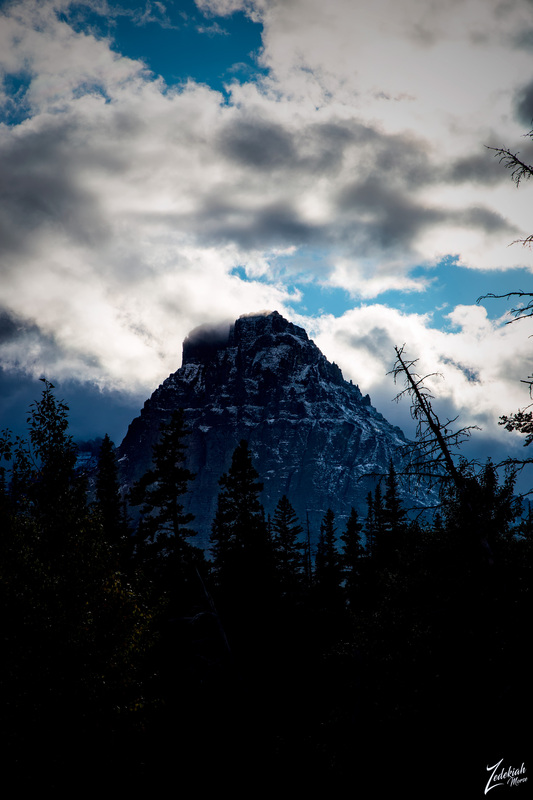 In this image above, Sinopah Mountain stands strong against the elements. Sinopah is Blackfoot for “Kit Fox” or “Prairie Fox”. But in this usage, it means “Fox Woman” as Sinopah Mountain is named in honor of Sinopah, the famous wife of Rising Wolf and the daughter of Lone Walker, a powerful Blackfeet Chief. 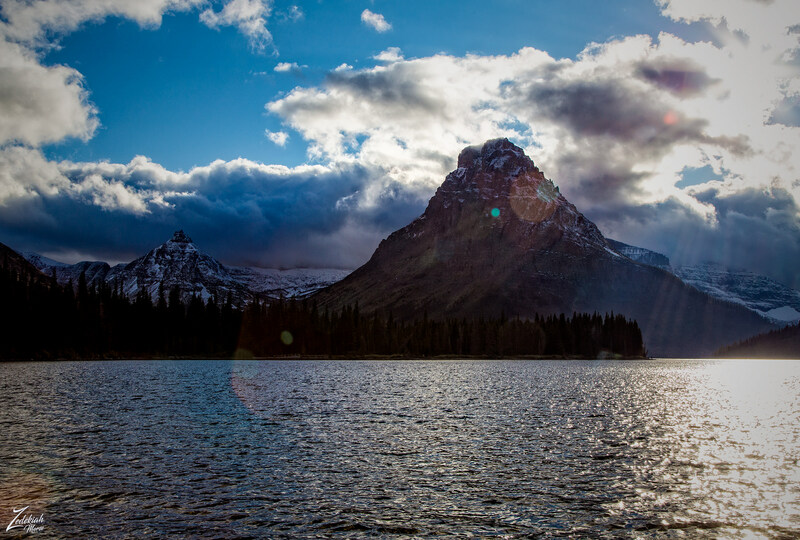 In the image below, across the serene waters of Two Medicine Lake, Sinopah Mountain (right) sits next to Painted Tepee Peak on the left. In the image below a frozen Two Medicine Lake is surrounded by the towering range of mountains; in the middle right above the lake is Sinopah Mountain with Mount Rockwell and Chief Lodgepole Peak behind. To the immediate left of Sinopah Mountain is Painted Tepee Peak with Grizzly Mountain behind it and to the right of Sinopah is Lone Walker Mountain and Mount Helen sitting above the small frozen Upper Two Medicine Lake. On the very right side of the image is Rising Wolf Mountain. Blackfoot legend says the Great Spirit Na’pi created the environment. And the overall objective in life was to harness and develop good relationships with the Great Spirit to be graced with enough food and to a good life. Seeking guidance from the creation of the Great Spirit, nature, they would embark here for Vision Quests. They sought a natural guardian spirit and by traveling into this harsh and beautiful wilderness they would enter into a period of solitarily fasting and praying, this is how one receives messages from the Sun Creator. It is easy to see the ancient tribespeople, traveling along the bank of these waters and traveling into the mountains to seek a place of silence, solitude for their ceremony.